Renesmee. i definitley dont think this is the BEST description, but this little girls cutee so i edited it and put this picture up(: what do you think. 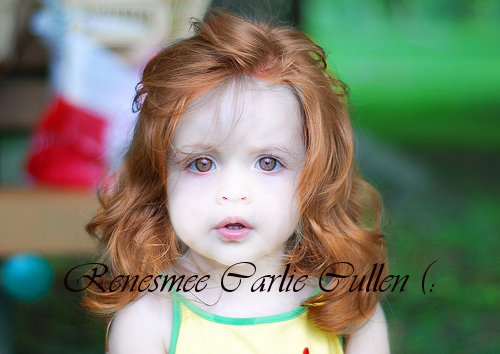 Wallpaper and background images in the renesmee carlie cullen club tagged: carlie renesmee cullen renesmme carlie cullen nessie older renesmee carlie cullen. holly_renesmee, that was rude! If you don't have anything pleasant to say, don't comment. :O She does not look like a horse-face! She looks like an angel! Your girl isn't all that cute. just hard to edit her , okay? fully fits RENESMEE, i mean c'mon. and im 13 of course i cant be renesmee. don't want to be mean but,where is her nose?